Spokane County District Judge Mike Padden's last day on the bench is Monday, when new and incumbent judges will be formally sworn in to the bench. A retiring Spokane judge and former state lawmaker used his influence over the years to help a former employer collect millions of dollars through county contracts and special-interest legislation, moves that forced many traffic violators and others to pay substantially higher fees. 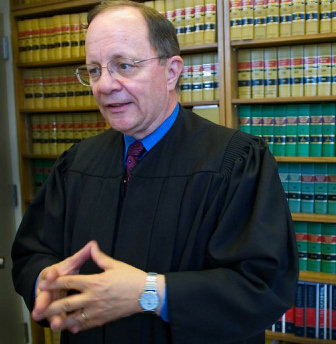 District Court Judge Mike Padden disputes any impropriety, but acknowledges that his advocacy on behalf of Valley Empire Collection gave the appearance of a conflict. Padden served as the company’s lawyer prior to being appointed to the Spokane County bench in 1995 and while he was serving in the state House of Representatives. Yet a series of interviews and a review of state and local documents by The Spokesman-Review show a pattern of favoritism that helped funnel more than $3.79 million in fees and interest payments into the collection agency’s coffers since 2003, which were the most recent figures provided by the court. “In 1995, while serving in the Legislature and working as an attorney for Valley Empire Collection, Padden co-sponsored a bill, later made law, that allows collection agencies to automatically add a $125 attorney fee to any contested collections case against individuals who bounced checks. “Four years later, after being appointed District Court judge, Padden successfully advocated hiring Valley Empire Collection to handle collections of past-due District Court accounts despite objections from half of the six-person selection panel. Of the 10 bids submitted, eight agencies would have charged lower fees than Valley Empire. “In 2001, Padden’s son accepted a paid internship from Peterson Enterprises, which owns Valley Empire Collection. The following year, Padden voted with other judges to expand Valley Empire Collection’s business by awarding it a second contract to handle all Municipal Court collections as well. The Spokane Valley-based collection agency is owned by Troy Peterson, who described Padden as a longtime family friend. Peterson acknowledged fielding dozens of questions in the past about his business’s association with Padden. But he disputes any notion that he received special favors. Questions over Padden’s advocacy on behalf of his former client have long circulated within Spokane’s legal community and elsewhere. Jim Nichols, former Spokane office manager for Allied Credit Companies, said he and his former colleagues believe they were squeezed out of the Spokane Municipal Court collections contract in 2002 because of Padden. In an interview Wednesday, Padden, 60, acknowledged that in 1999 he lobbied a search committee to select Valley Empire Collection as the District Court’s collections agent even though it proposed charging residents much higher fees than most of the other bidders. Padden said he believed it was important to have a local company get the contract. Allied, which opened a Spokane office about that time, was based out of Gig Harbor in western Washington, he said. “There is something to be said about people who know the local area and know the difference between High Drive and Hillyard as far as where people live and what they can do,” Padden said. Padden also acknowledged that he voted, with other judges, in 2002 and 2004 to continue the contract with his former client rather than recuse himself, even after his son took a paid internship with the collection agency. Tim Durkop, a local attorney who represents clients in cases against collection agencies, said the District Court’s decision to hire a firm with higher fees has made it more difficult for residents to get out of debt. Padden countered that the law allows collection agencies to charge a fee equal to 50 percent of the debt owed. Valley Empire Collection charges delinquent court clients a 40 percent fee. “This is allowed by law as an add-on. And the working poor and everybody else has all sorts of opportunities to take care of that obligation before it goes to collection,” Padden said. Valley Empire’s entry into District Court collections began with Padden’s advocacy. Rita King, a judicial assistant who once worked as the assistant District Court administrator, said Valley Empire Collection was turned down as a service provider prior to the 1999 bidding process for a new collection agency. King sat on that six-member panel with Padden to review proposals from 10 companies seeking the contract to collect debts for both District and Municipal courts. Allied Credit Companies submitted the lowest bid, proposing a 15 percent fee on all collections for everything from unpaid parking tickets to court fines, according to county purchasing records. Valley Empire proposed a 40 percent fee – which was the second highest bid next to Automated Accounts Inc., which proposed 50 percent, records show. That difference can be significant. For example, a person with an unpaid $100 ticket under Valley Empire Collection’s proposal would start out owing $140 before other court-imposed fines, fees and interest are added. Under Allied’s proposal, a $100 debt would start at $115 before other costs are added. Susan Mahn, the criminal justice administrator for the city of Spokane and a member of the 1999 selection committee, said she was adamant that the contract go to Allied. “I just could not go with Valley Empire because the fees were too high for those small amounts,” Mahn said. She complained that with all the add-on fees, collection agency fees and late fees, a $10 ticket would balloon to about $70 under the proposal from Valley Empire Collection. “That just did not sit well with me,” Mahn said. King said the committee split at 3-3 with half opting for Allied, which Padden acknowledges had more experience working with courts. The other half, including Padden, voted to choose the higher bid from Valley Empire. “During the meeting, Judge Padden got really upset and indicated that (he was) making a decision right now that we are going to split the contract,” said King, who later worked for Allied. Padden said he doesn’t remember what happened except that the contract was split with the District Court contract going to Valley Empire and the Municipal Court contract going to Allied. “In hindsight, you know, maybe you could say that I shouldn’t have been involved. But I was trying to use my expertise,” he said. Allied officials were dumbfounded, Nichols said. Nichols said Allied officials got no response to inquiries made to Padden. “We immediately speculated that it was because of his business relationship with Valley (Empire),” Nichols said. After the 1999 decision to split the contracts, Allied officials talked about having some regulatory authority review the search process or even filing a lawsuit, Nichols said. Instead, Allied officials decided to simply win over the judges by showing them that Allied provided better service. Nichols said he left Allied before 2002 but kept in touch with company officials, who would not comment for this story. Spokane County commissioners appointed Padden to the bench in 1995 to replace his former law partner, Judge Raymond Tanksley Jr., who had died of cancer. Padden, a conservative anti-tax Republican, had spent 14 years in the Legislature. It was just prior to his judicial appointment that Padden had pushed the bill ensuring that attorneys representing collection agencies would receive a $125 fee in cases against people who wrote bad checks, even if the two sides settled the dispute before going to trial. Until then, a check bouncer could settle the claim by paying off the check, some interest, “a reasonable handling fee,” up to $40 in collection costs, plus incurred court and service costs. But what counted as “incurred costs” was unclear. Some judges allowed collection agencies to tack on an extra $125 in attorneys’ fees even if the case hadn’t gone to trial. Other courts wouldn’t allow that. Padden was one of six co-sponsors of House Bill 1771, and he recommended it for approval by the House committee he chaired. The bill automatically tacked on the $125 fee in all such cases. “This additional fee will make it more cost-effective for the holder of a bad check to pursue the collection of that debt in court,” prime sponsor Rep. Tim Hickel, R-Federal Way, told lawmakers during floor debate in 1995. A handful of lawmakers objected, but the measure passed and was signed into law. Padden said at the time that check writers would have gotten a notice from the merchant, thereby avoiding the $125 fee if the bad check was “just an inadvertent mistake,” according to state records. In the interview this past week, Padden denied that he ever earned any money from the bill. It hadn’t yet become law when he was appointed judge later that same year. However, Durkop said Valley Empire Collection has worked out arrangements with many businesses, steering any bounced checks directly to the collection agency. In one case, Durkop’s client wrote a $148 check to a business that bounced. The client called the merchant right away to make arrangements to pay, Durkop said. But the merchant informed the woman that the matter had already been forwarded to Valley Empire Collection. She called Valley Empire to settle the matter but was told not to worry until she got a notice in 30 days, Durkop said. When the notice came, she learned that with penalties and fees – including $125 from Padden’s bill – she now owed $458, and Valley Empire Collection was already suing her. If people don’t like the fees for collection agencies, Padden said, they have a remedy. He pointed out that many debt collectors work on commission. Durkop said he has seen many of the same defendants come before District Court, and he understands how the judges can lose compassion in an overworked system. Padden said he doesn’t plan on doing any legal work during his retirement. He bristled when asked if he planned to go back to work for Valley Empire.